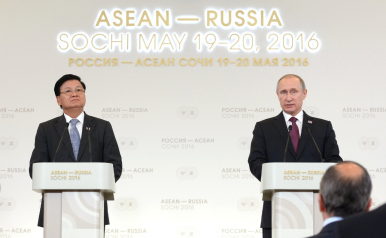 A photo of Lao and Russian leaders during the ASEAN-Russia Summit held in 2016. What’s in the New Russian Battle Tanks Deal for Laos? Though details remain unclear about a recent delivery of military equipment, it has spotlighted the defense ties between both sides. Over the past few weeks, reports have been surfacing about the delivery of Russian tanks as well as aircraft to Laos. While few specifics have been disclosed about the exact nature of the transfer, it has nonetheless highlighted some of the ongoing activity in Russia-Laos defense cooperation and spotlighted Moscow’s ongoing activities in the country. As I have noted before in these pages, Laos and Russia have long had a close defense relationship that extends across several realms, including military education, law enforcement cooperation, and the purchase of military equipment. But ties have been on the uptick of late with several key developments over the past couple of years, including the signing of a contract on military and technical cooperation, deals on assistance on helicopter repair and procurement deals, and even talk of a new Russian defense facility in Laos. Defense ties between the two sides had continued to be developed through 2018 and were expected to be furthered in 2019 as well. Following the delivery of defense equipment including repaired helicopters in 2018, Lao officials had previously suggested that new Russian made military equipment, including tanks and aircraft, were expected to follow suit through the end of 2018 and into 2019 as well, ahead of Lao National Army Day which had been set for later in January. Over the past weeks, news of the delivery of Russian military equipment to Laos has put the defense relationship in the headlines once again. In particular, in mid-December, news reports began surfacing that noted that a number of T-72B ‘White Eagle’ MBTs and YAK 130 fighter jets had been delivered to Laos. Few additional specifics have been disclosed about them, including their numbers and exactly how they would be paid for. Radio Free Asia cited anonymous sources as saying that the cost was expected to amount to several million dollars and the Lao government would pay Russia via mining concessions and development projects rather than through money. Though there has been no official confirmation of this, it has raised questions about some Russian activities in the country, including the surveying of mines and assistance in clearing unexploded ordnance that Russian media have been highlighting. It is difficult to assess these military equipment transfers given the few details we have about them. Further specifics may be more readily available with time, as they get incorporated into the Lao military and as we see developments such as the National Army Day later this month. Those additional details will be important in evaluating what this development and others of its ilk mean for the broader development of the bilateral defense relationship between Russia and Laos. A closer look at a recent development in the context of bilateral security ties. Where Are Russia-Laos Military Ties?What’s Behind the New Russia-Laos Military Facility Hype?Russia-Thailand Military Ties in Focus With Helicopter DisplayWhat’s in the First Russia-Brunei Navy Dialogue?What’s Next for Russia-Philippines Maritime Ties Under Duterte? India and Japan conducted an anti-submarine warfare exercise off the western coast of India on April 24. Putin: North Korea Is Ready to Denuclearize – If It Gets GuaranteesThe Missing Voices at China’s Belt and Road SummitTransatlantic Cooperation in the Indo-Pacific: Where Does Southeast Asia Fit in?Economic Focus Ahead for Indonesia in Jokowi’s Coming Second TermChina’s Navy Flaunts Its Power, But to What End?